Many of us have a tendency to develop “seniority amnesia”. When we gain positions of power at work or at home, and we seem to forget how our decisions and actions would feel if we were on the receiving end of them. You hear something or experience events and decide to drop a relationship or judge someone as not capable. You make an assessment of someone’s talent, potential, and performance based on the way you process and add meaning to the data. You deliver the final dagger to someone’s career and motivation by not taking the time to have a direct conversation with them, and instead, go on to share your assessment with other important stakeholders. You are not curious, don’t ask questions, and do not allow the time to find out directly. Imagine how it feels when others treat you in the same manner. You would probably be frustrated, angry, demotivated, and would in some cases, look for other opportunities. Is this how you would want your leadership legacy to be remembered? As someone who uses their position power to damage others or cut relations with little curiosity to gather collective intelligence, reflect, weigh, teach, and make a balanced decision? Anyone who has studied behavioral and social psychology understands the aphrodisiac that power and prestige deposits into our neural pathways. I have been there and tasted it. It is addictive. On an individual level we start to see ourselves as superior, smarter, having better judgment, and ultimately better decision makers than others. On the group level, we seek others who are closer to our perceived social and power standing. We start to talk differently, behave differently, think that others will not understand our situation and do not have the experience, intelligence, and background. These self-limiting assumptions will cripple organizations that are keen to succeed in the 21st century. Taking Accountability and Apologizing – Great leaders will not allow the ego-self to dominate. They take accountability and apologize when they notice that their ego has made them hide behind the trappings of their positions and avoid difficult conversations directly and with an open mind. Your colleagues will never be able to convey your message in the same manner and with the same level of specificity as you, and frankly, it is unfair to put them in that position. Your priority is your talent, your relationships, and the human fabric that, if motivated, will take you to the next level of success. This is not an elective it is part of your job more so than the endless meetings you attend. As an example of the power and status mentality, the following example is prevalent. I have coached leaders at every level in global Fortune 500, entrepreneurial, and non-profit organizations. I have the references, experience, and track record in every facet of coaching. However, I am surprised by those with a fixed mindset that believe only a CEO can coach another CEO or that only those with experience in a given industry can effectively coach their leaders. Surely every professional serving a client needs to study and learn the essential facts and context of the organizations he or she works with. However, coaching is essentially a way to enable leaders to get in touch with their true selves, understand their emotional and habitual triggers/tendencies, the early warning systems that their physical selves are providing, and to create a reflective space for coach and coachee to examine decisions and actions from a more informed and detached stance. Why do I connect with some people and not others? Why do I hire some people and not others given similar experiences and performance? Why do I trust some people and not others with no direct evidence in hand? Why am I attracted to some things and people and not others? Why do I keep pushing for my pet projects and have a hard time changing my stance with new information? Why do I change my point of view and how I feel about people that leave my organization? Why couldn’t Kodak roll out digital technology they already had in a more timely fashion? Why am I having a hard time getting closer to my neighbor with a different political orientation from me? When am I in flow and when do I act from my lower self? We convince ourselves that our decisions are brilliant and completely logical as do each side of the aisle in Washington D.C. Therefore, the emphasis in selecting a coach should be on his or her ability to create credibility and safety so that the coachee will share their most intimate thoughts and feelings, that unchecked, will result in decisions and actions that affect large groups of people and the success of the organization. These executives already have an army of strategic advisors who provide them technical advice. They require someone with expertise at the intersection of behavioral science and business. Take the time today to make a list of some of the decisions where you hid behind your power or when you just were “too busy” to bother with the people who you perceive as lower than you in status or power. Or if you generally shy away from direct conversations. Ask yourself how would you feel if you were on the other side of the interaction? If there is one principle that you have time to focus on in the 21st century it should be the golden rule. Dweck, C, PH.D. Mindset, The New Psychology of Success. New York: Ballantine, 2006. Kolb, DA. Experiential learning: Experience as the source of learning and development (Vol. 1). Englewood Cliffs, NJ: Prentice-Hall, 1984. Mlodinow, L. Subliminal: How Your Unconscious Mind Rules Your Behavior. New York: Pantheon Books, 2012. When was the last time you reached back and acknowledged those who helped you get where you are? Would your relationships say that you treat them as you would like to be treated? If not, what is the ego saying? Do you agree with it? On your last day when they are giving the goodbye speeches, how do you want to be remembered? A teacher/coach? Looked up to with awe? Liked, missed with genuine tears? Polite applause? Pleased align your resources and time behind your strategy. I was stationed in Amsterdam and leading/building a successful practice for one of the globe’s largest management consulting organizations. Outside observers would have said I was the rising star. As an expatriated employee and a practice lead, I had checked the success boxes. I had a comfortable townhouse in the outskirts of one of the most beautiful cities in Europe. I traveled the world extensively and could match interesting and adventurous stories with anyone. I was surrounded by people who, due to my reputation and brand in the organization, wanted to be with me and be part of the energy that was propelling my success. Like so many of us, I was on a treadmill to the top. My organization developed internal broadcasts of me and a team member and shared them with every office around the world. Visitors from other offices would routinely stop in to meet me and benchmark their offerings and practices to ours. Etc, etc, etc. An early spoiler alert, the high was followed by a loud crash. There is a metaphor that I so love which asks “Is your doorknob from the inside or the outside?” This means, have you cultivated a sense of purpose and belonging through which you filter information, people, feelings and behaviors and let pass through only those that are aligned? Or, do they come and go like party crashers at their whim and you are more akin to a weather vane spinning with the direction of the changing wind. I was clearly in the second category. My sense of success in personal and professional life was defined from the outside. When I would get attention and praise, I would take flight and experience a delicious high much like the effects of a powerful drug. Equally, I had a great deal of difficulty processing feedback and criticism. It was as if someone had a knife in their hand and had planned to take my life and all that was important to me. Needless to say, this resulted in disappointing professional, and most importantly personal, consequences. When I invited my family to join me in Amsterdam, my ex-wife looked inside herself, and to her credit, decided that there just was not enough in the marriage for her to move the family. And ultimately, that horrific day arrived when we told our 8-year-old son and 11-year-old daughter of our pending divorce. I remember it as if it was yesterday. It was a nice day on a bench in Amsterdamse Bos, a beautiful park in Amstelveen, a suburb of Amsterdam where I lived. My son, in the pure and angelic voice that 8-year-olds have, and with tears in his eyes, looked at us and asked: “Why don’t you just tell each other you are sorry”? Looking back, I am now convinced that it was that seminal moment that started my journey towards becoming wholehearted and my passion for whole brain leadership. Something profound shook my inside when I looked into his eyes as the window to the wisdom that we are born with. It made me feel the depth of his question. What was running my life? Whose life was I living? What was I running away from? What was it that I had to hold onto? How did I make my decisions? How did I want to be remembered? Who and what was important in my life? What were my values and how was I living them? How connected was I with the people around me? Needless to say, the answers that came to me were profoundly disturbing. For me, it has taken years of reflection, therapy, coaching, missteps, and corrections along the way to finally come at life with my whole brain. My goal has been to elevate above my thoughts and emotions so that at the most critical times in my life when I make an important choice and take actions, I am serving my purpose and higher goals. So that I am not unduly influenced by my auto response, thoughts, or feelings. And, as Victor Frankl so profoundly expressed it, I am building a “space between the stimuli and response”. A technique that I have used for myself and my clients is to see these thoughts and feelings as guests around my dinner table. Each has their own name tag—the voice of ego (yes, we all have it and at times helpful), the voice of cynicism, the voice of anger, the voice of hurt, the voice of insecurity, the voice of love, the voice of hope, etc. Like an accomplished host, I like to become as familiar with each voice as possible. So that I know the meaning, the tone, the texture, its effect on my body. In this way, I am never surprised by what they may say and can respond to it effectively. I like to pay attention to which voices are the loudest and demanding the most attention and why. Which voices are less heard and where are they sitting around the table. Like a good host, I ask myself am paying equal attention to all of my guests or only the ones that I am most familiar with? How am I introducing my guests to one another and how are those conversations going? For example, when the voice of despair speaks to me am I introducing him to the voice of hope and what are they saying? In this way, rather than running away from my thoughts and emotions, I am inviting them in but from an elevated and unattached stance. Knowing that I am so much more than my thoughts. Knowing that in my lifetime I have the proof that it is possible to fundamentally change oneself. And, most importantly, knowing that leadership at work and home requires that, at the most critical times when decisions are made and actions are taken, I use all of the information available, including my own understanding of my biases and habits. It is a fallacy to think that Nelson Mandela was not resentful of the treatment the Afrikaans had afforded him through 27 years of hard labor and prison. The reason he chose to invite the Afrikaans into his rainbow coalition is that he was able to elevate above his dinner table, name the voices that were speaking into his ears, compare and contract their advice to his purpose (serving and building the new South Africa), and make the right choices. The U.S. culture is routinely assessed by intercultural experts such as Geert Hofstede1 as one of the most masculine and individualistic cultures in the world. Masculine cultures are characterized by a belief system that values competition and hard work over relationship building and collaboration. These cultures are founded on the belief system that the aggressive and dominant species will outmuscle and outrun the weaker and more collaborative ones. They rely on the leader of the tribe being the smartest, fastest, strongest, and most agile and the victor of the winner take all/zero-sum contest. Conversely, these cultures see feelings, tears, joy, uncertainty, anxiety and other natural human emotions as not belonging in the competitive arena of business and certainly not the type of behavior that a strong leader would engage in. This repressed and outdated view of global business and leadership is the reason why, once I complete with my obligatory business and credibility dance with many of my clients and they finally let me in and start to talk about the real issues that are facing them, the emotional dam breaks. When it breaks I find myself on the receiving end of years of repressed and unattended emotions that have been forced into an artificial construct called business behavior. They share their lack of trust of others. Talk about their loneliness and disconnectedness from their friends and family. Acknowledge the relentless pace they are pursuing and the wear and tear on their bodies and relationships. They share their insecurities regarding a myriad of topics such as not keeping up with technology, being threatened by younger up and comers, what they will do with themselves and how they would fit in postretirement, etc. When leaders repress their own emotions they lose their connections to their soul. And when they cannot connect with their authentic selves they lose the ability to connect at deeper levels with their followers. Connecting with others and to belong are basic human needs and the only sustainable way to influence and motivate others. In so doing, we are soft-wired through our mirror neurons to feel other people’s emotions and to not use them is to atrophy the muscles that million years of evolution have bestowed to our species. 1. Hofstede G, Hofstede GJ, Minkov M. (2010). Cultures and Organizations: Software of the Mind. McGraw-Hill. When did you last take time to slow down and think about the above topics? Can you in any way relate to it? If not why not? If it speaks to you, what are you prepared to do to address it? Great leaders regularly ask, “What are my intentions and how are my choices, behaviors, and the resulting outcomes aligned with my intentions?” Much like how the early voyagers used the North Star to navigate their vessels, so must the leader declare his or her intentions as the destination and examine the choices, behaviors, and resulting outcomes. Intentions are our outcome-based values. They translate our values into ideas that we can connect to our worlds and lives. For example, if you say your intention is to serve your family, what you are saying is that you would like your choices, behaviors, and the outcomes to further the well-being of your family. For clarity, you may ask yourselves, “If I were to get into a road rage with the driver of another car does that support my declared intention?” My guess is that if your family witnessed the road rage scene, it is likely that they would not think of your choice, behaviors, and potential outcome as being in their interest. 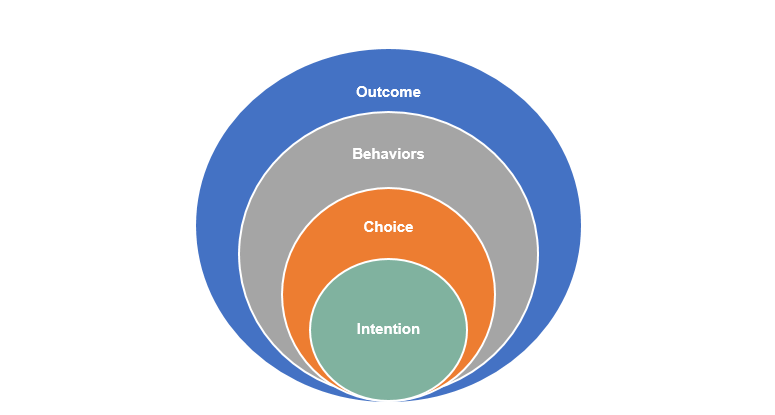 This is an obvious example, but there are thousands of decisive moments when leaders are not present to and mindful of the misalignments between their stated intentions and their choices, behaviors, and the resulting outcomes. The leader who states that his intention is to be a fair and inclusive leader and set the example of the power of diversity and inclusion and then hires and promotes people with like interests and personal beliefs, downplays their mistakes or shoddy work, while amplifying that of others. The leader who declares her intention is to be a global leader, but upon assuming her role in a new location, tries constantly to change the local culture to that which she is more familiar and comfortable without a thorough understanding of the context for the local ways. The leader who declares wellness and balance as an important goal for the organization, but who, himself, cannot turn off work at home and sends emails late in the evening and weekends, therefore role modeling an informal culture that his followers assume to be his real intentions. The good news is that trained and self-aware leaders can self-check regularly to monitor the alignment between their espoused intentions and their thoughts and actions. This is what coaches call the state of “self-mastery”. The stage at which leaders gain an unattached reflective stance that allows them to examine their actions and decisions from the balcony and understand the habitual thoughts and feelings that drive the execution of their intentions. When the leader is attached to the “ego self” or the “habitual/domesticated self” it is an excellent opportunity to reflect on the question, “How are my choices and actions serving my intentions?” Often the leader is operating on auto pilot and may not be consciously aware of the misalignment. What motivates and drives you in performing your responsibilities? How does that compare with your understanding of the role as seen by the most important stakeholders? What important decisions have you made lately? Why do you consider them as important? How does your decision align with your intentions or espoused purpose? How did you role model and execute your decision? What do you think the perceptions of others were regarding your performance? How did the outcome of your decisions and actions align with your intentions? How did they work for you generally? Those of you who have not spent time on this progression of thinking and decision-making may want to take the time afforded in this New Year to think about what is really driving you and whether you are honoring your leadership role by making the right choices and actions. How are you assessing yourself in the journey from intentions to outcome? Are your intentions aligned with the organization’s expectations? If you are not aligned, what can you do? This phrase is used in many forms. Based on my experience working with numerous leaders, what distinguishes great leaders is their readiness to be present to pain and suffering and to the ensuing learning and growth. Nelson Mandela, Martin Luther King, Hamdi Ulukaya (CEO, Chobani Yogurt), and Victor Frankl and Candy Lightner (founders of MADD – Mothers Against Drunk Driving) all had this in common. They were present to their suffering and challenges as it was occurring, and through it, they learned to look for opportunities for learning and growth and then reinvented themselves in ways that touched the world. We have created a “happy pill” culture. We have come to expect fulfillment and happiness as a controllable outcome and when things don’t go according to plan, we get disappointed, anxious, jealous, angry, revengeful, threatened, insecure, and sometimes clinically depressed. As a leader, it is critical to understand that the mindset of entitled fulfillment and happiness is an artificial construct that is prevalent in the western world. Many cultures, such as the one I originate from, believe in the duality of the universe. In these cultures, good and bad, happy and sad, fulfillment and disappointment etc., are the natural rhythm of the cosmos. It is through experiencing these polarities that we, as humans, expand our emotional and intellectual range and are able to connect with others through understanding and empathy. Leaders who have not gone through the range of human emotions or are now insulating themselves from their emotions often exhibit behaviors and decisions that are not well-informed and are out of touch with the human fabric that is at the heart of their organization’s effectiveness. In order to reap the full benefits and growth, it is necessary that we persevere through the emotions that come with disappointment and sadness. It is not to ignore it, deny it, blame, rationalize, defend or force a different thought. Left unattended, the thoughts and feelings will fester and show up in multiple ways. For example, the way in which we get habitually triggered to make impulsive and reflexive decisions. If we learn to name these emotions, push through them by experiencing and observing them, and learn to have a conversation with them, we can turn an unfulfilling event into an important learning opportunity. One of the techniques that I use is to imagine that you are having a dinner party. You have invited your cynical and negative inner voices. Assign a name tag for each of your dinner guests. Names such as “impostor” for the voice that says you don’t deserve or are not qualified for this job, or “touchy feely” for when the cynic is instructing you to not honor your intuition or emotional intelligence when making decisions. The idea is to engage in a conversation with each voice, hear what they have to say, and then present the alternative perspectives and learning to the guest that is speaking. In doing so, it is imperative that you stay with the emotion that comes with each conversation and start to get familiar with the intensity, shape, and physical manifestations of it. So for example, when engaging with the “impostor” it is important to notice the feelings and thoughts that come with being told you are an impostor. Once experienced, a retort may be “We have had this conversation often. Whenever I reach for higher ground you tell me I am an impostor. But when I look around the table I feel I am just as qualified as others since we all have strengths and areas for development. In addition, so far, my performance has shown that I am up to the task. Thank you for the advice. I know I have to learn a few new things but I am not an impostor I am deserving of this job…” Notice not only the words you are using but the feelings that are present when you talk back to the inner voice. Are you feeling positive energy? Are you feeling less trapped? Are you feeling frustrated by having to have the same talk with your inner voice? Are you not believing what you are saying? The answer to these questions are clues for the work ahead. With repetition you will gain self-mastery. Rather than these voices controlling your emotions, thoughts, and actions, you will see them coming, know what they feel like and how to converse with them to use the voice productively to learn, and no longer be held hostage by them. In my life I have gone through much adversity. My father was told by the Shah of Iran to take a job in the U.S at the Iranian Embassy because the Shah was threatened by his popularity. As a result, I was put in a middle school in the U.S without speaking a word of English. This was a time when English as a second language programs were rare. It was sink or swim and an age when children can be extremely cruel. My country was taken away from me through a revolution and I had to make a life in a foreign country, in Wall Street, and in organizations that espoused very different values and beliefs than those that I was taught. I have experienced two painful divorces. The last one resulted in the company I built over 16 years having to be sold and dissolved. And I am currently having to get emotionally ready for my ex-wife’s move to Virginia which will mean that my 8 year old son, whom I adore, will live over 300 miles away from me. All of these experiences were/are devastating. However, I would not be the person that I am without them. Each has accelerated my personal growth in its own way. I have experienced a wider range of human emotion and am able to better connect with others, improved my level of listening and presence, and I am more curious and I have slowed down my pace to reflect and take input before making decisions and acting. In addition, with each adversity, new doors and opportunities have surfaced when I have been present to them. Let me be clear, I am not discounting the pain and suffering that I have gone through. However, rather than surrendering to resentment, I have tried to see these events as natural markers and vistas in the lifelong journey towards self-awareness and learning. I have discovered that regretting the past is futile. When I made the decisions that I made, I was a different person and those decisions served me at that time. I have also learned that comparing myself with others is not very helpful. Each of us occupies a unique body and is wired differently. The journey is intended for us to self-actualize in ways that are natural and accessible to us. You are all fellow travelers in this journey and I welcome the chance to connect with you and share and explore the many twists and turns. To what extent have you learned from your past challenges? What has helped and what has been blocking your learning? What is your way of addressing adversity? What comes to mind when we think about our immediate family? For most of us, family means those we spend a great deal of time with. They are our last line of defense. The people we turn to when we are vulnerable, need support and empathy, and can team with us to get our family goals accomplished. They welcome our strengths and work with us to address our flaws. A family is also the place where we show our leadership as fathers, mothers, brothers, and sisters. We understand that the goal is for our family to win as a unit. We try to love and care for our whole family and not pick favorites that are more like us. We try to get to know them and find out which interpersonal strategies are better placed to work with each family member. We do it because we have a mental model that says my family is my source of identity, validation, and fulfillment. Many leaders draw a solid line between how they regard their immediate family versus their work family. On average we spend approximately 75% of our waking lives with our work family. Our professional success is, to a large extent, dependent on our ability to navigate productive and positive relationships with them. Like our immediate family, we need a group of people at work who have our backs and will provide us honest and helpful feedback. Our family feels empowered to do so because the feedback is not meant to be mean or to put us down but given because they care and want to see us prosper. The origin of their feedback comes from the primitive part of the brain, the part of their body where pure emotions are generated. We listen for their intent and their message in its purest form, sometimes coming across as awkward and unpolished. We thank our family for providing us the feedback and work with them with equanimity on the delivery of the message. Carry a mindset of goodwill and disqualify members by exception. Most of us want to work on a winning team where the members invest in the success of development of others on their team. Connecting, being cared for, and feeling like we belong is a basic human need at home and at work. When you start with trust and goodwill you usually get back engagement and support. Demonstrate your family mindset through your actions. How aware are you of the dinner conversations regarding your organization when your team members are at home? To what extent are you aware of their anxieties, aspirations, needs, and personal styles and preferences? At home, these would be minimum requirements for establishing a trusting and caring relationship. You probably would not be pleased if your family preferred to share these emotions with others and not you. What is your preference at work? Great leaders connect with team members in deep and meaningful ways so as to inspire and motivate them. Their team feels invited to engage and interact with them. Seek input and surrender to your vulnerabilities. Our home family would withdraw from us if we were free to tell them what they should be doing but never asked their advice or probed for how they felt. Or, if we showed up as the superhero who has no faults, is self-sufficient, and only involved them in areas where we felt they had unique expertise. What would be the reaction if we told our spouse they are not qualified to provide feedback on our work lives? Or, if we told our children they are not old enough to have a view on the remodeling of their house? What makes us think that the people in our teams would react differently? When our family sees that we are proud of them and speak as a unit they get energized and feel included. They sense that they are part of our long-range plans and not there to just fill a temporary need. They start to see their welfare and ours aligned and know that at the right moment they will be recognized (another foundational human emotion and need). Enable and equip your family. Sometimes our families need guidance, training, outside expertise, and experiences. We provide personal advice and feedback, summer camps, schools, therapists/family counselors, piano teachers, sports coaches, etc. Often, not being fully skilled is confused with lack of motivation or intent. However, it may well be that our families will show their highest selves through the learning experiences we provide them. Work through the inertia and complacency. When we initiate new experiences and learning at home with our families, it is not unusual to get pushback or resistance. Convincing your spouse to enroll one of your children in summer math camp versus the usual “fun camp” might require patience, understanding, care, and creating a new vision. In addition, once a new routine is started, it takes process, discipline, and resilience to ensure that it will be sustained. Keeping to an agreed spending allowance for your children will require repeated reinforcement in the face of skilled operators who know how to pull at your heartstrings. The same is true at work. How often do you think of your team at work as part of your family? If seldom or never, what is in the way of it? What are some principles and ideas that you can leverage from your home family to your work team? How would you describe your work team to your family and vice versa?